It’s fair to say that it takes something of a long time to put our Wealden Times stand up … and down! 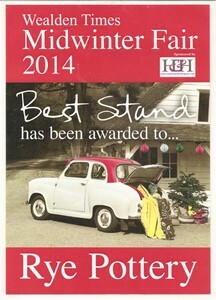 So large thanks from all at Rye Pottery to Wealden Times Editor Lucy Fleming & Harpers and Hurlingham’s Jane Beard for naming Rye Pottery as this year’s “Best Stand” at the MidWinter Fair. The Wealden Times MidWinter Fair is a hugely popular Christmas Market held at the charming Victorian Walled Garden at Bedgebury Pinetum. Visitors come from far and wide but it’s a “must” in the Kent & Sussex calendar for locals too. Whatever the weather the event is staged in warm marquees with wonderful food and lunch stalls making it a great way to get going on your Christmas shopping. It’s a huge compliment to win given such strong competition, so we’re all very chuffed indeed.